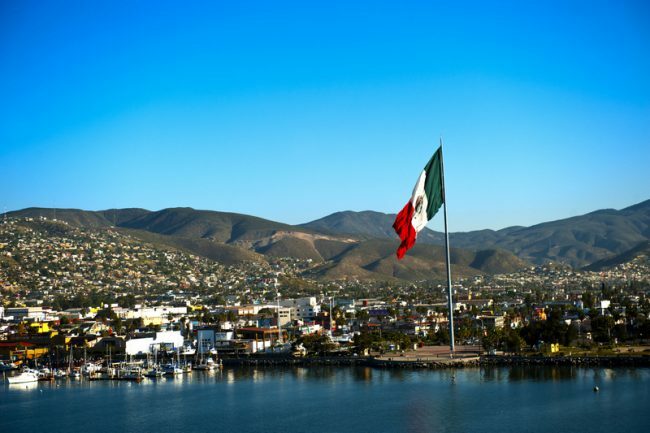 Ensenada is a popular town to visit in Baja California, Mexico thanks to its proximity to the US border. It’s an easy weekend or day trip from San Diego and it’s also often visited by cruise ships – which is how we visited. We spent a day in Ensenada as part of our Carnival Imagination cruise. I have been to Mexico many times although never to Baja California. And while Ensenada is never going to make my top 10 list of best places to visit in Mexico, it is a nice place to visit and the five of us had fun in Ensenada. Something we did notice on our day in Ensenada port was that not many people from our cruise actually got out on foot to explore the town. This is a shame! 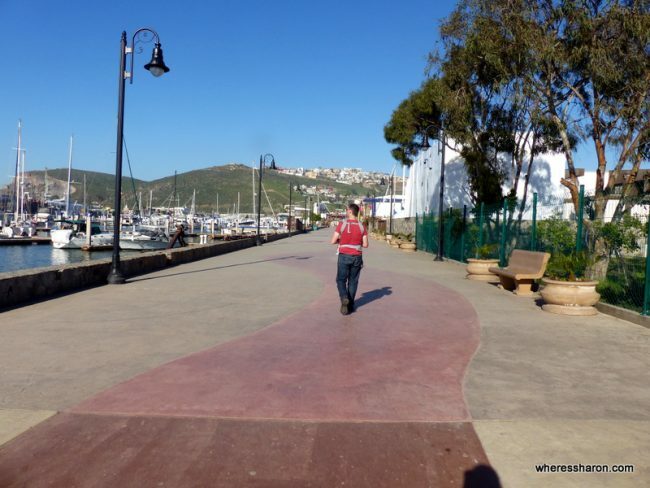 Ensenada is a very easy place to walk around and explore on foot from the Ensenada cruise terminal. I wonder if this lack of exploration is due to a lack of good resources. I know when I was googling Ensenada things to do before I left, I could only find lame lists that had things like go shopping, take your souvenirs back to the ship (!!!! ), drink something alcoholic. It left me wondering if there are any fun things to do in Ensenada. Thankfully, there is! You just have to get out there and walk around. 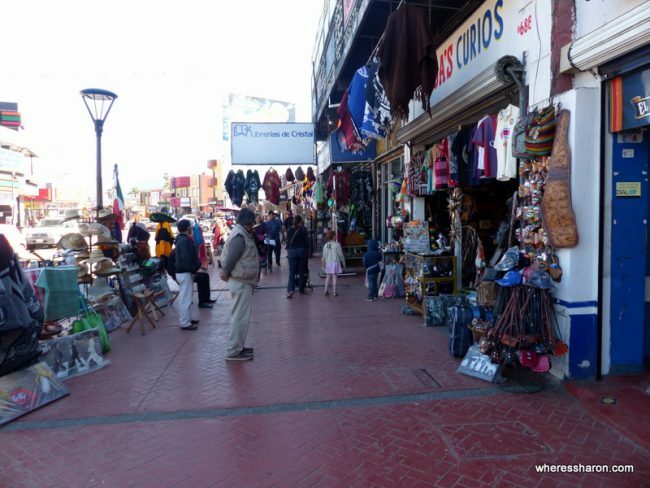 And, of course, use this guide of things to do in Ensenada cruise port to get you started. 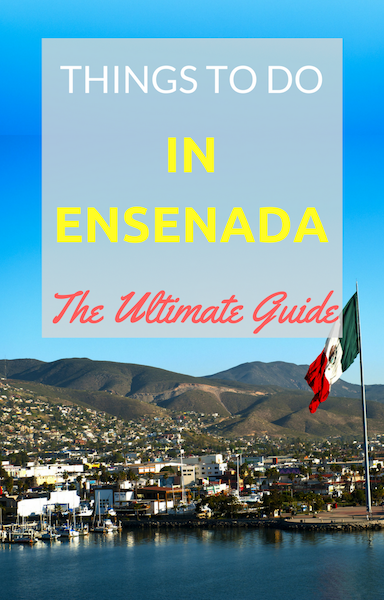 Below you will find our guide to what to do in Ensenada, some things to do in Ensenada Port that you might want to think twice about, things to do in Ensenada with kids and an Ensenada tourist map. One of the first things to do in Ensenada on a cruise that you will come across is the Malecon – a lovely wide path along the oceanfront. As you leave the cruise terminal and walk down towards its entrance there’s a bridge off to the left which will take you Ensenada’s Malecon. Initially the Malecon is quiet, but it hits attractions and restaurants for tourists and locals. It’s a nice way to start your exploration of Ensenada in a relaxed low key way. One of the big things you will notice on the Malecon is a huge Mexican flag and pole. You won’t be able to miss this. Towards its far end, the Malecon and the streets just off it become dominated by places to eat. With the local seafood market here as well the emphasis is on seafood and (fish/prawn) tacos. 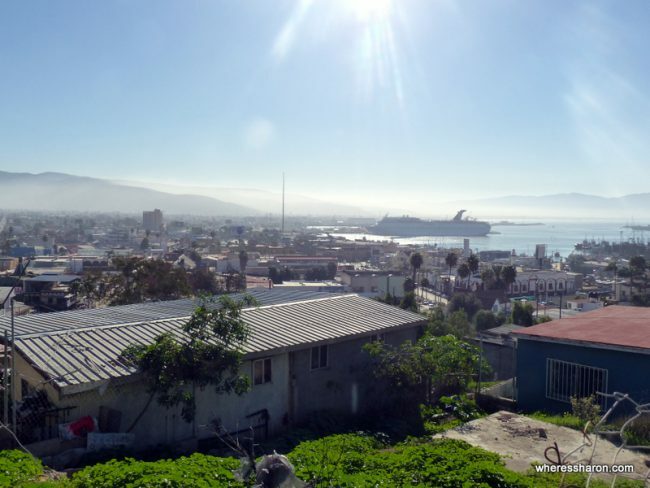 Overlooking the port and the city of Ensenada is a lookout which will give you some great views on a clear day. If you’re up for some exercise you can walk up the streets (there’s some stairs as well in different places but they don’t form a contiguous route) to the top. Confession: We were carrying a baby and are lazy so didn’t make it to the top. Even if you fail like us, however, there are nice views along the way and we enjoyed the walk. 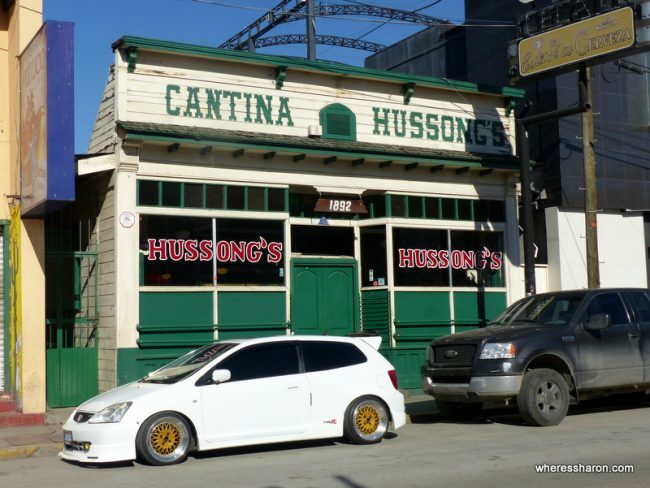 This can make a great first stop of the places to go in Ensenada before the sun gets too hot and everything else opens. 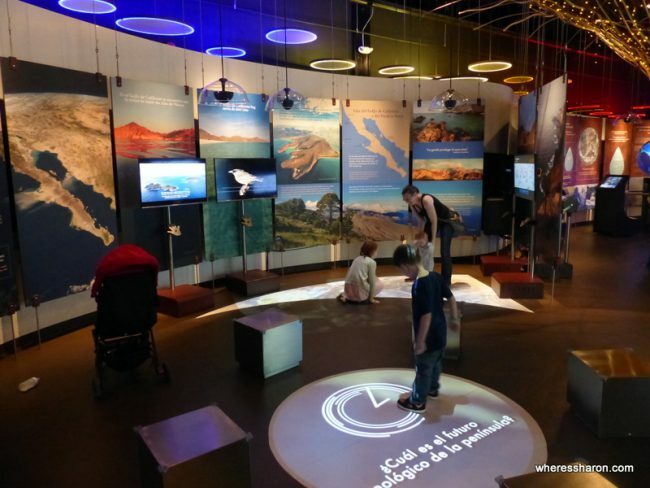 This well presented, small museum is very close to the cruise terminal and located in the old Riviera del Pacifico casino building. It’s a lovely setting and also home to the Casa del Culturo which has classes, films and art. 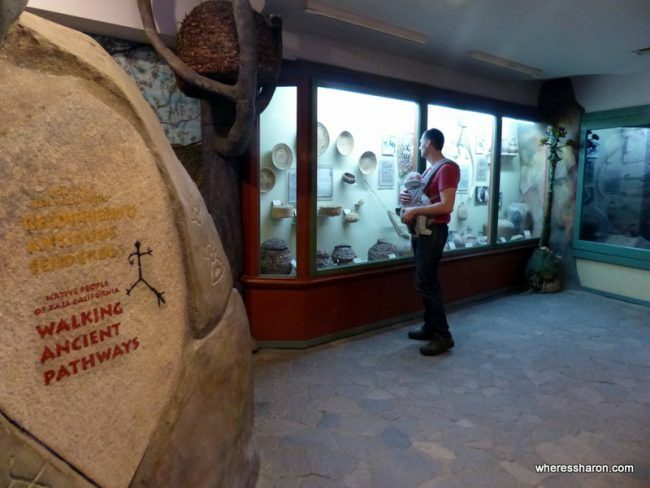 The museum itself is about the history of the area from the time Baja California was formed to today with an emphasis on the history of the indigenous people. 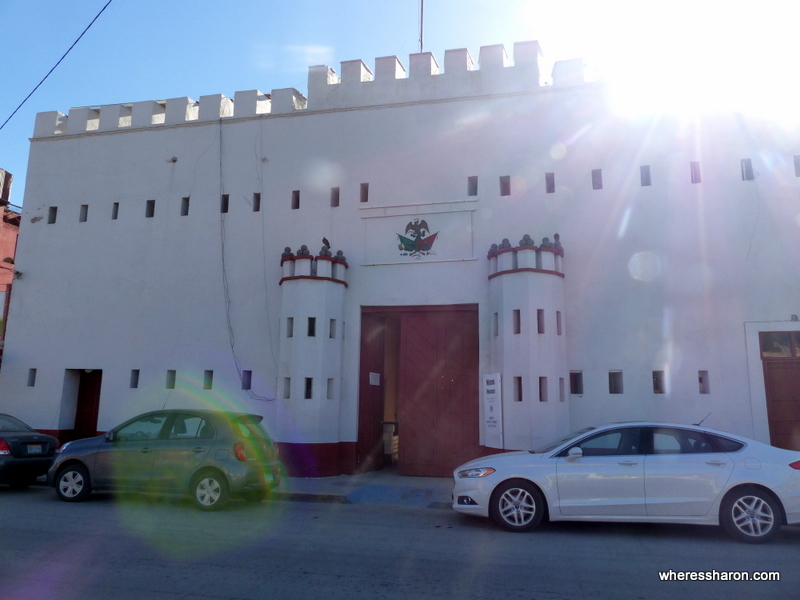 It’s an easy place to visit while in Ensenada and worth the effort. 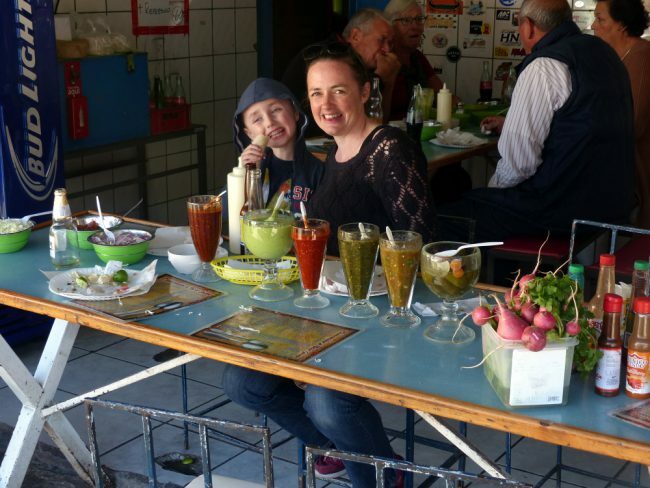 Our kids were extra excited to be in Ensenada as they had a bucket list item to eat tacos in Mexico because they are huge fans of tacos back home in Australia. So we were extra excited to hit up a taco restaurant for lunch. We ended up at Tacos Lucero which was a great choice! We coincidentally seemed to choose a taco place that was popular among the locals with many of them flocking to get tacos while we were there. The kids were initially disappointed as they are quite different here to what they are used to but they soon got over that and munched many down! I liked how there were so many different sauces lined up. That seems to be common here but I had never had so many to choose from before. The tacos were delicious. This cantina is famous for being the home of the margarita – it’s believed they were first made here. It’s a simple, famous and fun cantina and makes a nice contrast to the nearby bars which have been built with tourists firmly in mind. Please note this is a bar and not somewhere to go to eat. You will not struggle to find places to buy souvenirs – there are many stalls around. They particularly seemed to congregate at the far end of the Malecon when walking away from the cruise terminal and Avenida Lopez Mateos. 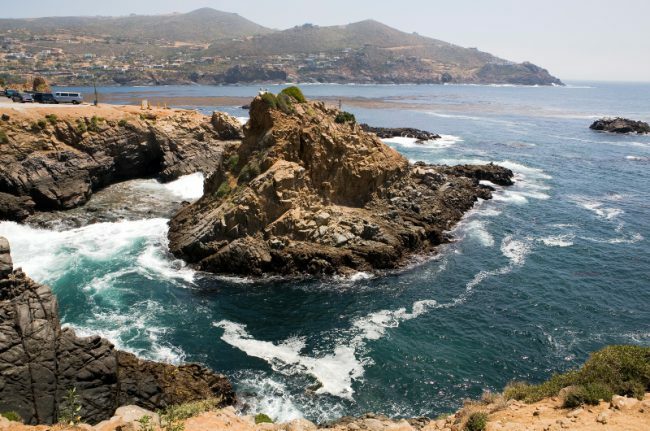 Visiting La Bufadora, a blowhole 40km south of Ensenada, seemed to be one of the most popular answers to what is there to do in Ensenada when looking through the shore excursions on our Carnvial cruise. If you’re lucky, you can see water shooting up to 30 metres in the air. It’s possible to catch a taxi here or do a tour. In addition to some great food Ensenada is a fantastic place to sample the local drop. 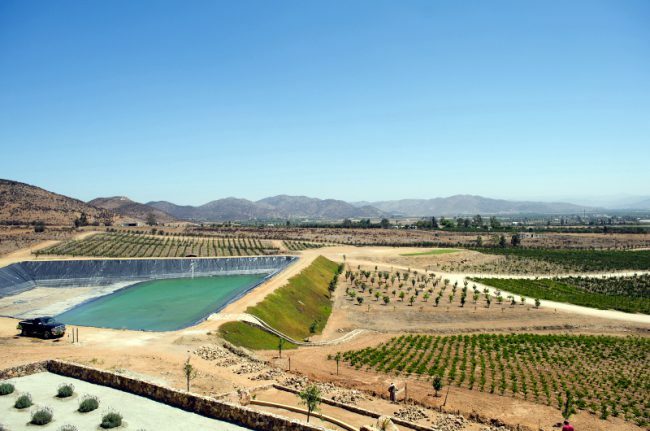 Several wineries are located outside of Ensenada. If you’re visiting Ensenada on a cruise many of these wineries can be visited by booking a shore excursion. It appears to be a popular thing to do in the region. Some of the best wineries are Bodegas de Santo Tomas which has some fantastic rich wines. Vinedo Cuatro Cuatros is a place to visit to see some great views in addition to tasting some good quality wine. The restaurant is located at the top of the hill so you also can take in the sights. Unfortunately limited time meant we could not visit a winery ourselves but we heard some great reviews from others who had visited them. We visited this museum as it was one of the few things to see in Ensenada that was listed in Lonely Planet. I am writing about it here simply to tell you to probably not bother if it is something you are considering. 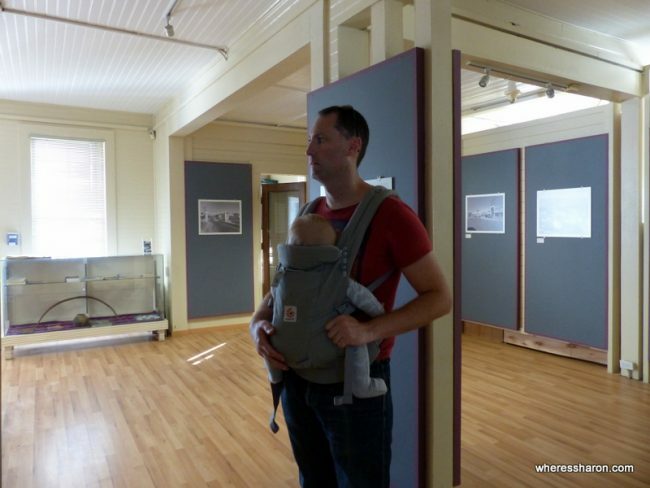 The “museum” is basically ordinary offices with some framed pictures of Ensenada from its past in the first room and along the hallway upstairs. The photos are interesting enough, but simple and actually don’t look much different to Ensenada today. It does feel awkward and weird to be in someone’s office building though. This museum was temporarily closed when we visited so I can’t say how worthwhile an addition it is to a what to do in Ensenada port list. If you have been here, I would love to hear about it in the comments! 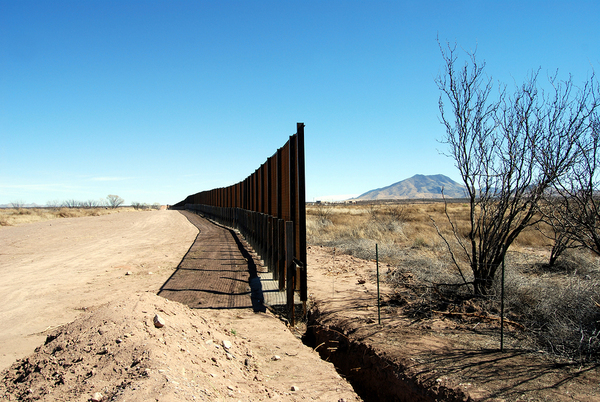 Venturing futher into Mexico? Check out this list of the best places to visit! We visited Ensenada with our kids aged 6, 4 and 7 months old. We left the older two kids in the kids club for part of the day and then explored with all three kids for part of the day. The vast majority of items on this list are suitable with kids or without. Near the Malecon and a plaza with the giant flagpole is a cool ship themed playground that our kids loved. It was also busy with local kids so it was a fun way for them to interact. This museum was a great surprise for us. 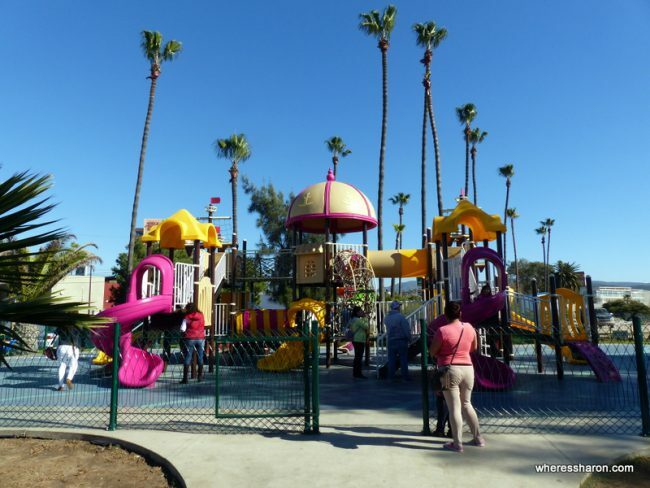 It’s located at the entrance of the cruise terminal in a new building and was a fun thing to do in Ensenada with kids. 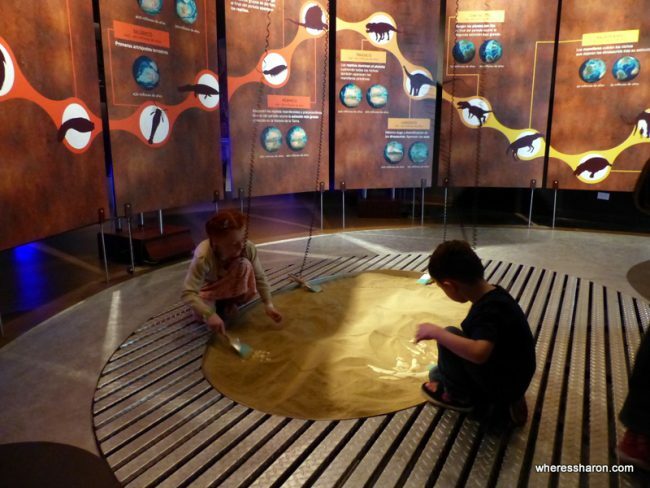 The science museum is quite small but very well presented and our kids loved it. There’s information on global warming and the two poles, Earth and planets, finding fossils, generating electricity and the treasures located under the sea and on the beaches thanks to ship wrecks in time past. The kids had a great time doing things like looking for fossils in sand and generating electricity with light, wind and water. The fossil part in particular was especially good since we had been at La Brea Tar Pits in LA just a few days earlier learning about how they find fossils there. This attraction seemed quite new and I think they may be adding to it. There were Spanish signs outside that mentioned an aquarium and planetarium which we didn’t find, and I assume they are on the way. The entry price is currently 60 pesos for adults, 30 for kids, free for under 5’s. Very reasonable! Ensenada is a great place to visit for the day, but if you do decide to stay there are some beautiful places. Depending on what interests you, you can choose to stay waterfront of located closer towards to wine valley. 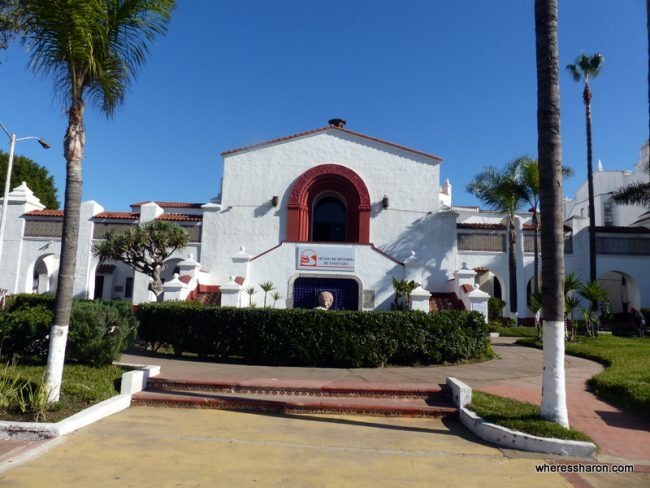 There are some great places to stay in Ensenada to suit any budget. Hotel Quintas Papagayo – Located close to the wine region and with views of the ocean, this hotel has it’s own swimming pool and features simple but comfortable rooms. You can even choose to stay in a two-bedroom chalet which are beautiful and very affordable. Click here to see the latest prices. Posada El Rey Sol – With a great location right next to the Main Street, rooms at this hotel are elegant and comfortable. The hotel has a pool and jacuzzi along with free WiFi and affordable rooms. The onsite restaurant also serves up dinner and breakfast. Click here to see the latest prices. Hotel Quinta Santa Teresa – Located a bit away from the downtown area, this luxurious holiday is the ultimate getaway and is a popular hotel for those looking for a destination close to the wine region. You can choose a suite with 2 queen beds and stay here in luxury, and with several restaurants located a stones throw form the hotel it offers an escape in and of itself. Click here to see the latest prices. I had read beforehand that you can use US dollars everywhere in Ensenada and this was true for us. Keep in mind that when the rate is posted in pesos, they won’t use a great exchange rate – we were given 15 pesos to US$1 or even worse and the official rate was closer to 21 pesos when we visited. There are exchange places around and these are easy to find. We changed some money over and then sucked up the bad rate for the small amount more that we spent. The choice is yours! We enjoyed Ensenada. 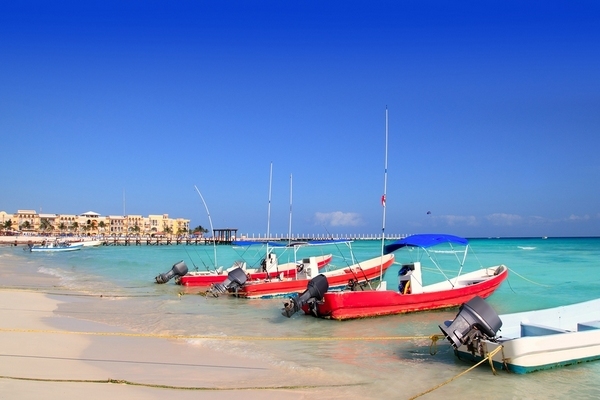 It is a great place to visit on a cruise as a day is enough to have a nice little taste of Mexico in this town. It’s easy to explore and has everything you need. There’s some nice activities in Ensenada and it’s an easy place to visit. 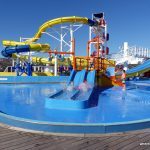 If you are looking for Ensenada cruise reviews, read our Carnival Imagination review. You can also read our guide to Catalina Island which we also visited on this cruise and nearby San Diego. We went on this cruise as part of a 2 week trip to Southern California. Read all about it here. Disclaimer: This article contains an affiliate link. If you make a booking after clicking on it, we may receive a commission at no extra cost to you. Thanks for supporting our site! 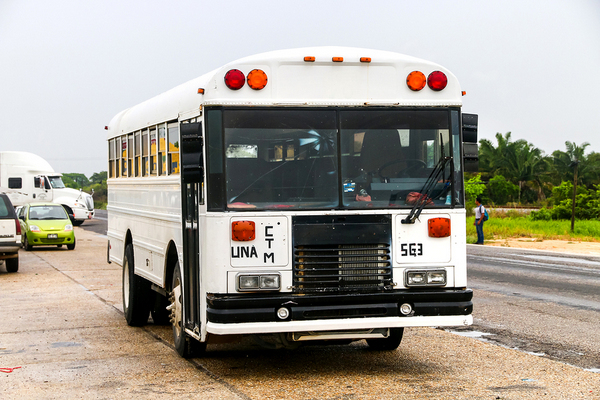 Mexico US border crossing – attempt two! Top 25 Things to see in Tasmania: The Ultimate Bucket List! Next Time visit Las Cañadas you won’t regret it !! Thank you for all the great info. I have never been there and am looking for a little jaunt to take my Sweet Hubby on!! ?